Amarillo Poco EazyMcQ d.o.b. 24/01/2013 - our stud stallion. He is homozygous tobiano and will enable us to proceed with our extended breeding program which will now include APHA registered American Paint horses. His first foal on the ground is a stunning very dark bay tobiano filly. We are expecting 4 APHA foals from him at the end of 2016 and are very excited about his next foal crop. Book your foal in utero to make sure you do not loose out on his next foal crop. The American Paint Horse is a breed highly valued for its colour and markings, but it is also a favourite because of its unique refinement and intelligence. The Paint horse has long been used in perfomance competitions as a show horse. The American Paint Horse shares a common ancestry with the American Quarter Horse and the Thoroughbred. A registered Paint Horse should conform to the same "stock horse" body type desired in Quarter Horses: a muscular animal with a broad chest and powerful hindquarters suitable for rapid acceleration and sprinting. Yet Paints display a remarkable degree of refinement and beauty, especially about the head and neck. The modern American Paint Horse is a naturally intelligent beed that is known for its amiability. Its good nature, plus its innate inteligence, makes the American Paint Horse a pleasure to train for performance competitions, and above all, an ideal companion outside of the ring.The stock type conformation, intelligence and willing attitude make the American Paint Horse an excellent horse for pleasure riding, ranch work, showing, trail riding or a friendly family horse. Although Paints are one of the preferred breeds for western riding and reining, they also excel in Hunter under Saddle classes and even in dressage. The American Paint Horse is a breed of horse that combines both the conformational characteristics of a western stock horse with a pinto spotting pattern of white and dark coat colours. Developed from a base of spotted horses with Quarter Horse and Thoroughbred bloodlines, the American Paint Horse Association (APHA) breed registry allows some non-spotted animals to be registered as "Solid Paint Bred", and considers the American Paint Horse to be a breed with distinct characteristics, not merely a colour breed. While the colourful coat pattern is essential to the identity of the breed, American Paint Horses have strict bloodline requirements and a distinctive stock-horse body type. To be eligible for registry, a Paint's sire and dam must be registered with the American Paint Horse Association, The American Quarter Horse Association, or the Jockey Club (Thoroughbreds). At least one of the parents must be a registered American Paint Horse. There are two categories of registration, regular, for horses with colour, and solid Paint-bred, for those without colour. In addition to bloodlines, to be eligible for the Regular Registry of the American Paint Horse Association (APHA), the horse must also exhibit a "natural paint marking", meaning either a predominant hair coat colour with at least one contrasting area of solid white hair of the required size with some underlying unpigmented skin present on the horse at the time of its birth. Or, in the case of a predominantly white hair coat, at least one contrasting area of the required size of coloured hair with some underlying pigmented skin present on the horse. Natural Paint markings usually must cover more than 2 inches and be located in certain designated areas of the body. Although Paints come in a variety of colours with different markings and different underlying genetics, these are grouped into only four defined coat patterns: overo (includes frame, splash and sabino), tobiano, tovero and solid. TOBIANO: The most common spotting pattern, characterized by rounded markings with white legs and white across the back between the withers and the dock of the tail, usually arranged in a roughly vertical pattern and more white than dark, with the head usually dark and with white markings like that of a normal horse, ie. star, snip, strip, or blaze. # FRAME: The most familiar overo pattern, which in homozygous form, results in Lethal White Syndrome (LWS). Visually identified frames have no health defects connected to their colour, and are characterized by ragged, sharp white patches on the sides of the body, leaving a "frame" of non-white colour that typically includes the topline. # SABINO: Often confused with roan or rabicano, sabino is a slight spotting pattern charcterized by high white on legs, belly spots, white markings on the face extending past the eyes and/or patches of roaning patterns standing alone or on the edges of white markings. # SPLASHED WHITE: The least common spotting pattern, splashed whites typically have blue eyes and crisp, smooth, blocky white markings that almost always include the head and legs. The tail is often white or white-tipped, and body markings originate under the belly and extend upwards. TOVERO: spotting pattern that is a mix of tobiano and overo colouration, such as blue eyes on a dark head. Toveros come with 6 basic coat charateristics, which may be present in differing combinations and configurations. 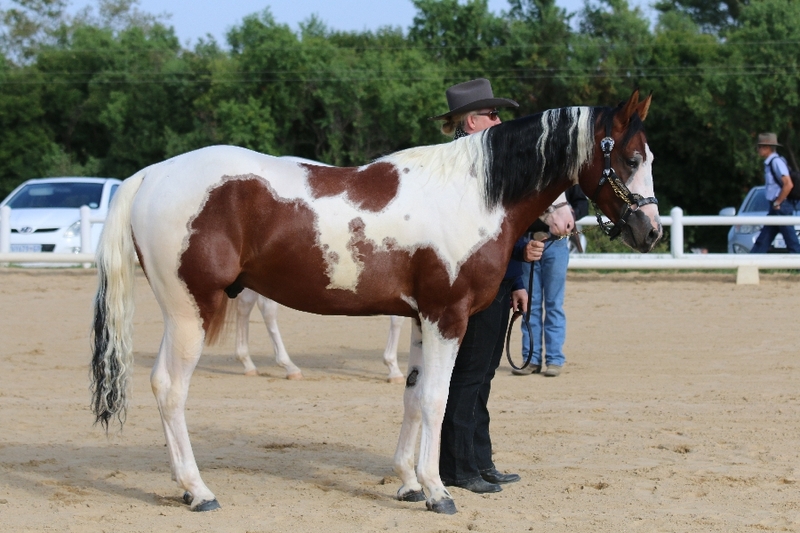 Toveros appear, depending on their patterns, to have the ability to consistently sire Paint colour at the rate of 80% or higher, bred to either tobiano, overo or solid mares. Toveros are genetic goldmines whose colour producing potential is just beginning to be understood and appreciated. SOLID: A horse otherwise eligible for registration as a Paint that does not have any white hair that constitutes a recognized spotting pattern. A pinto differs from a Paint solely due to bloodlines. A pinto may be of any breed or combination of breeds. For a horse to be registered as an American Paint Horse however, it must have registered American Paint Horse, American Quarter Horse, or Thoroughbred parents.One medical issue associated with the breed is the genetic disease lethal white syndrome (LWS). Also called Overo Lethal White Syndrome (OLWS). It is linked to a recesssive gene associated with the frame overo pattern. Horses that are heterozygous carriers of the gene do not develop the condition and are physically healthy. However when a foal is born that is homozygous for the LWS gene, it should be humanely euthanized shortly after birth, or else will die within a few days from complications involving an undeveloped intestinal tract. A DNA test is available for LWS so that horses who are carriers of this gene are not bred to another. LWS is also not unique to Paint Horses: it can occur in any equine breed where the frame overo coat pattern is found. The American Paint Horse Association (APHA) requires that all breeding horses be tested for the 5 panel genetic diseases and LWS before being bred or the foals will not be eligible for registration with APHA. Both the stallion and the mare should be tested before breeding. Our new Smokey Black filly! Caseys Dream Tammy Jo Georgia in HQ magazine! Youth Seclection Show @ Afridome 05/07/2012 for AQHA Youth World Show 2013 !!!!! !